I've had a purple-laced-funk cloud hanging over me for several days now. Back in the days when my kids were little I'd describe their down-in-the-dumps-days as "grumpled" . Well. grumpled or funked - I'm there. Whatever the reason, I know I have to snap out of it, burst the cloud of doom that's following me like a wet dog on a Saturday. No offense to the dog who smells like goose poo - he loves rolling in it! and is licking his paws - an annual early summer occurrence that no number of vet visits have been able to figure out. I began this day looking for that silver lining. My garden offered the first hope. Roses and deep-purple velvet-petaled iris dominate. The roses were lovingly transplanted from my old house to this new garden. As I snipped rich red Abe Lincoln, pale coral Nancy Reagan and delicate pink Princess Elizabeth in the cool of very early morning I relaxed into the memories of choosing these particular varieties with my late husband. I chuckled at the memory of him falling backwards into a rose tree and snapping it. My remedy was to fill the gap with neosporin and wrap the trunk tightly with bandage - to this day , seven years later, that rose tree has a funny bump at the site of the wound but continues to offer glorious blowsy white roses twice a year. The iris are double re-gifts. Jill gave me some corms. When I divided them I gave some to Sylvia, a gardening friend. She in return brought me corms last year for my new garden. When I divide the iris, I'll pass some on to another friend. 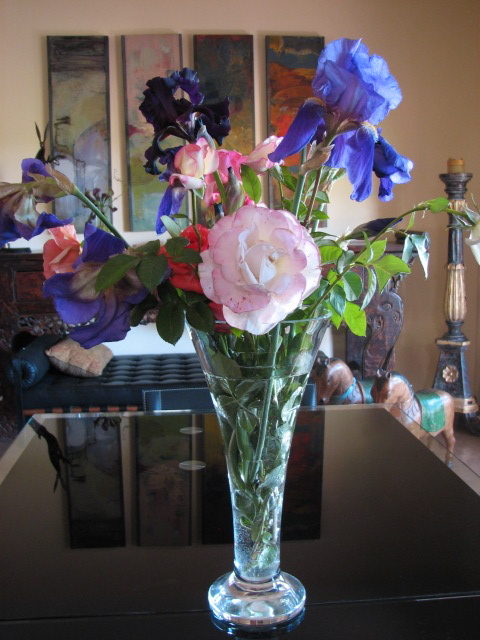 Iris and roses fill a beautiful contemporary Waterford crystal vase bought in Dublin on one of the last trips David and I made together. We both were uneasy about the price - he insisted we buy it and so today it holds the colors and memories that are fast lifting this bleak mood. My silver lining was here after all. I just needed to open my eyes.